Introducing the Deck used “Soulburner”, the Duelist with the burning soul, who is a character in the animated series “Yu-Gi-Oh! VRAINS”! 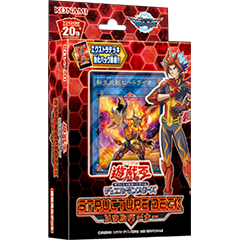 “STRUCTURE DECK Soulburner” (on sale December 8th) is a preconstructed Deck that makes use of the powerful effects of the “Salamangreat” series by making use their ability to come forth with what the anime dubs “Reincarnation Link Summon”!! Enjoy this blazing hot style of Dueling! Also, this Deck comes with an “Extra Deck Power-Up Pack”! 2 of the cards in that pack are Ultra Rares, but there’s the chance they might also be Secret Rares! Let’s check out the new cards and how to use this Deck! First let’s check out the playing guide, which is an image based on combos centered around the new cards! The basic strategy of this Deck is centered around bringing out FIRE monsters, starting with the various “Salamangreat”, and also using the main strength of “Salamangreat Heatleo” who can use powerful effects if it’s been Link Summoned using a card with the same name as material, which is called “Reincarnation Link Summon”. First, Special Summon various “Salamangreat” monsters from the hand and GY as material to Link Summon “Salamangreat Heatleo”. Afterwards, by using the effect of “Salamangreat Sanctuary”, you can Reincarnation Link Summon. Also, by using the monsters from the Extra Deck Power-Up Pack, it’ll be easier to assemble Link Materials and key cards. Once everything’s in place, aim for victory by using “Salamangreat” Spell/Traps with powerful effects, along with Reincarnation Link Summoned “Salamangreat” monsters. The Ace Monster With A New Illustration Appears! The preconstructed Deck comes with a new illustration, while the Extra Deck Power-Up Pack also contains its original illustration. By having a total of 2 copies in hand, you’ll be able to enjoy Reincarnation Link Summoning with this Deck. Decide Things With Reincarnation Link Summon, To Awaken Its True Power! Create A Favorable Situation With Its Two Effects And Make Inroads!! If this card is Link Summoned: You can target 1 card in your opponent’s Spell & Trap Zone; shuffle it into the Deck. Once per turn, during your Main Phase, if this card was Link Summoned using “Salamangreat Heatleo” as material: You can target 1 face-up monster on the field and 1 monster in your GY; the ATK of the first target becomes equal to the other target’s, until the end of this turn. Support Reincarnation Link Summoning With A New Link Monster And Xyz Monster! There’s a Rank 3 Xyz Monster that can control the field while also seting up for Link Summons, while there’s also a Link 1 Link Monster that can easily assemble the cards you need to Reincarnation Link Summon! It Has An Effect To Call Allies From The Deck, As Well As An Effect To Return Monsters On The Field To The Hand!! You can detach 1 material from this card; Special Summon 1 “Salamangreat” monster from your Deck in Defense Position, also you cannot activate monster effects for the rest of this turn, except FIRE monsters’. If this Xyz Summoned card is sent to the GY as Link Material for the Link Summon of a “Salamangreat” monster: You can target 1 monster on the field; return it to the hand. You can only use each effect of “Salamangreat Mirage Stallion” once per turn. A Link 1 Link Monster That Aids Reincarnation Link Summon With An Effect That Adds “Salamangreat Sanctuary” From The Deck To The Hand! If this card is Link Summoned: You can add 1 “Salamangreat Sanctuary” from your Deck to your hand. If a “Salamangreat” card(s) you control would be destroyed by battle or card effect, you can banish this card from your GY instead. You can only use each effect of “Salamangreat Veilynx” once per turn. New Monsters Appear With Powerful Effects That Support Link Summoning! Six new “Salamangreat” monsters appear that aid Link Summoning! Each have a second effect that great supports assembling on the field while they also have powerful effects that activate from the hand that bring themselves out and strengthen allies! Its Hand Effect Protects Allies From Battle And Regains LP!! It Also Has An Effect To Add Itself From The GY To The Hand! When a “Salamangreat” monster you control is targeted for an attack by an opponent’s monster: You can send this card from your hand to the GY, then target those 2 battling monsters; gain LP equal to that opponent’s monster’s ATK, also your targeted monster cannot be destroyed by battle this turn. When a “Salamangreat” monster you control destroys an opponent’s monster by battle and sends it to the GY while this card is in your GY: You can add this card to your hand. You can only use this effect of “Salamangreat Raccoon” once per turn. It Supports Link Summoning With Its Effect That Special Summons From The Hand! Also Keep Note Of Its Effect That Activates From The GY To Draw 2 Cards!! During your Main Phase, if you Link Summoned a Link Monster this turn: You can Special Summon this card from your hand to your zone a Link Monster points to. If you control no monsters: You can banish this card from your GY, then target 5 “Salamangreat” cards in your GY; shuffle them into the Deck, then draw 2 cards. You can only use each effect of “Salamangreat Mole” once per turn. Send “Salamangreat” Cards From The Deck To GY If Normal/Special Summon! Its Effect To Special Summon From The Hand Is Powerful! If a “Salamangreat” monster(s) is sent to your GY, except “Salamangreat Gazelle”: You can Special Summon this card from your hand. If this card is Normal or Special Summoned: You can send 1 “Salamangreat” card from your Deck to the GY, except “Salamangreat Gazelle”. You can only use each effect of “Salamangreat Gazelle” once per turn. Discard From The Hand To Power-Up Allies’ ATK! It Also Has Another Effect To Special Summon It From The GY!! If you control a “Salamangreat” card: You can discard this card, then target 1 face-up monster on the field; it gains 500 ATK until the end of this turn. If you control a “Salamangreat” monster other than “Salamangreat Spinny”: You can Special Summon this card from your GY, but banish it when it leaves the field. You can only use each effect of “Salamangreat Spinny” once per turn. Special Summon It From The Hand In Conjunction With Other Ally Plays! It Also Has An Effect To Prevent Set Opponent Spell/Trap Cards From Being Activated!! If a “Salamangreat” monster(s) is Normal or Special Summoned to your field, except “Salamangreat Fowl”: You can Special Summon this card from your hand. You can only use this effect of “Salamangreat Fowl” once per turn. You can send 1 “Salamangreat” card from your hand or face-up field to the GY, then target 1 Set Spell/Trap your opponent controls; that target cannot be activated this turn. Negate The Effects Of Cards On The Opponent’s Field! If There Are 3 Or More Allies In The GY, You Can Special Summon It From The Hand!! If you have 3 or more “Salamangreat” monsters in your GY: You can Special Summon this card from your hand in Defense Position. You can target FIRE Link Monsters in your GY, up to the number of face-up cards your opponent controls; return them to the Extra Deck, then you can negate the effects of face-up cards your opponent controls, up to the number of cards returned, until the end of this turn. You can only use each effect of “Salamangreat Beat Bison” once per turn. New “Salamangreat” Spell/Trap Cards Also Appear! Many Spells and Traps whose options can be selected depending on if there’s a Reincarnation Link Summoned monster on the field! Either Add An Ally From The Deck To The Hand Or Protect A Reincarnation Link Summoned Monster From Other Monster Effects! ● Add 1 “Salamangreat” monster from your Deck to your hand. ● Target 1 “Salamangreat” Link Monster you control that was Link Summoned using a monster with its same name as material; that Link Monster is unaffected by other monsters’ effects this turn. You can only activate 1 “Salamangreat Circle” per turn. The Equipped Monster Cannot Be Destroyed! A Reincarnation Link Summoned Monster Can Attack A Number Of Times Equal To Its Link Rating!!! Equip only to a “Salamangreat” monster. It cannot be destroyed by battle or card effects, also if it attacks a Defense Position monster, inflict piercing battle damage to your opponent. If the equipped monster is a “Salamangreat” Link Monster that was Link Summoned using a monster with its same name as material, it can attack monsters a number of times each Battle Phase, up to its Link Rating. You can only control 1 “Salamangreat Claw”. Destroy Cards On The Field! If You Have a Reincarnation Link Summoned Monster, You can Destroy Multiple Cards Instead! ● Send 1 “Salamangreat” monster from your hand or face-up field to the GY, then target 1 card on the field; destroy it. ● Target 1 “Salamangreat” Link Monster you control that was Link Summoned using a monster with its same name as material; destroy cards your opponent controls, up to that monster’s Link Rating. You can only activate 1 “Salamangreat Rage” per turn. Negate And Destroy The Activation Of A Spell/Trap Card Or Monster Effect! Reincarnation Link Summon To Reuse This Card!! When a Spell/Trap Card, or monster effect, is activated while you control a “Salamangreat” Link Monster: Negate the activation, and if you do, destroy that card. If a “Salamangreat” Link Monster is Link Summoned to your field using a monster with its same name as material while this card is in your GY: You can Set this card, but banish it when it leaves the field. You can only use 1 “Salamangreat Roar” effect per turn, and only once that turn. Check Out The Reprinted “Salamangreat” Cards!! Related cards are reprinted, starting with “Salamangreat Sanctuary” that supports Reincarnation Link Summoning! Check Out The Major Reprinted Cards!! There are multiple noteworthy cards included that have been used regularly in the past and are still used even now! There’s “Ash Blossom & Joyous Spring” that’s heavily noteworthy due to being used in all sorts of Decks, “Dogoran, the Mad Flame Kaiju” that can seize control of the opponent’s field and rid you of your opponent’s powerful monsters, “Formud Skipper” that simplifies Reincarnation Link Summoning, et al, there’s all sorts of powerful cards included!